Just made my best trigger yet! For those not in the know, quicksilver can be used to create custom short-cuts that do something when you press a certain key combination. I had already made a open Gmail trigger, so I can open Gmail just as simple as command+option+g. This ones pretty nice, but the one I did today combines my favorite Mac app (Quicksilver) with my favorite Mac editor (Textmate). 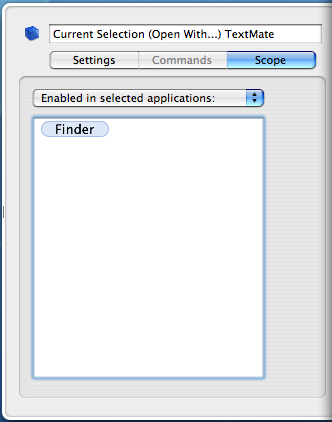 One nice feature of Textmate is its ability to open folders and display their contents on a side drawer. The part that always bothered me was getting to the right folder while in Textmate. I usually had it opened in the Finder, but then would have to re-navigate to it when I wanted to edit files in the folder. 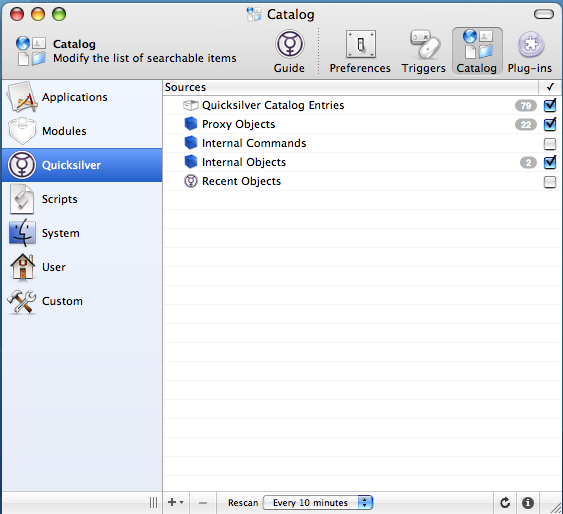 For this trigger I turned on the proxy objects in the Quicksilver section of the Catalog. This Gives you access to the ‘Current Selection’ proxy object, which represents what you have highlighted at any given time. Folders, files, whatever. It’s a very useful proxy. 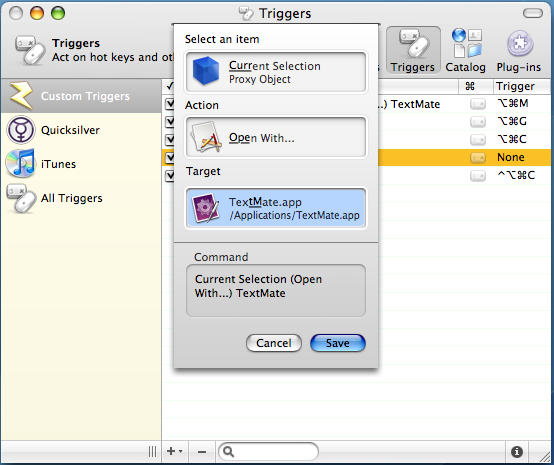 Now we are able to create a trigger that opens the Current Selection (i.e. a folder) in Textmate. Assign this to your keychord of choice (I picked command+option+m but I don’t know if thats a good one) and you’re ready to use Textmate, via Quicksilver, all the more efficiently. I found a problem with the key combination I choose, namely option+command+m is used to highlight text in the best pdf viewer / editor : Skim. So, what to do? I don’t like having three modifier keys as part of the key combination, so I didn’t really want to move to control+option+command+m. So I took advantage of another Quicksilver feature that lets you limit where your triggers are used. If you open the information pane for your trigger, and select the ‘Scope’ tab, you can set limits or exceptions to the validity of your trigger. Btw: You just type the name of the program you want to limit the scope to – so type it right. This is just a little post to help me remember how I got this stuff working. Subversion is a revision control system that is being developed to replace older similar systems. Revision control lets you update your projects in an iterative fashion and allows you to keep track of these changes. This is perfect for when you have a bunch of people working on the same thing and want an easy way that everyone can work on the same stuff without stepping on other peoples toes. I have used version control systems on a Java application we developed as a team last semester, and I plan on using it soon to develop web applications, but it really could be used for almost anything: a big proposal, documents for a conference, anything that you might work on in a step-wise fashion. Plus, it doesn’t have to be a group project to use Subversion. You can use it as an easy backup system so you can work on your stuff from any machine and use it in case you want to revert to an earlier version of something. They have a free book about how to use / setup Subversion, and there is a lot of info out there on how to use it. If you have the server set up, using a client to check-in and check-out projects is easy. For Windows there is a client called tortoisesvn that comes highly recommended. I guess it integrates with Windows Explorer to make things easy. For Mac you can use a precompiled command-line version (this one is the most popular and put out by Martin Ott of SubEthaEdit fame) or search for a GUI version. My favorite so far has been ZigVersion. SvnX is also recommended, but froze up when trying to connect to my server (probably because I was initially typing the location wrong). This is the tricky part. The easiest way to install it on a Mac that I’ve found is using Darwinports and this tutorial. I followed it excatly without any issues. Darwinports is so handy, everyone should have it installed by now. Then I used this section of the book to add basic authentication to my Subversion repository.